THE REVIEW: Lots of films have covered the 2008 financial crisis, both fiction and documentary, and I have seen a fair number of them including Margin Call, Too Big to Fail, and The Pit. I’ve always been fascinated with numbers, money, and the stock market, and of course, films based on true stories. The films I listed above, and the others which I’ve seen have all been intriguing and shed light on cool individual parts of the big picture — housing bubble, banks, impact, etc. What The Big Short does — and does extremely well — is make the crisis, and some of the people who saw it coming, relatable in a way no other film has done before. 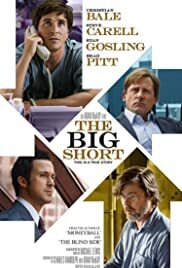 The Big Short understands that in order to fully understand and enjoy the film, you have to understand the hows and whys behind some of the jargon and goings-on in the crisis. Past films documented (and for the fiction cases, dramatized) events, but merely presented them hoping the viewer got what was going on for the most part. The Big Short is a perfect mix of drama, comedy, and instruction. It really gets you invested in the characters, the stories, and the fundamental workings behind how the collapse was allowed to happen. Comedy helps a tremendous deal in selling this film. While it’s much more aptly labeled as a drama, without the humor and it’s self-awareness, the film would most likely fall flat. At first, it’s a bit striking and unexpected. The film stops dead in it’s tracks and cuts to Margot Robbie, as herself, in a bubble bath sipping champagne to explain the technical details of (I believe) sub-prime mortgages, in plain English. Everyone in the theater laughed an awkward laugh because it was, and is, weird. Weird it may be, but the scene was certainly effective at illustrating sub-prime mortgages. When it happens again later in the film — with Anthony Bourdain and Selena Gomez — it’s less weird and feels like more a part of the film. THE TAKEAWAY: Of course, the most attractive part of The Big Short is the story. A group of guys who discover the market will crash three years before it does, and invest accordingly to make a profit. But the way it unfolds isn’t quite what you expect. Yes, these men do end up making a hefty amount, but it isn’t in the way you expect and it’s not done as a way to crash the market and destroy the world economy. It is actually quite a nuanced look at many aspects of the crisis, and it’s done in a funny and educational way. A possible Oscar contender according to critics, and certainly not out of the realm of possibility. But it’s not an early lock for any category and I await to see other potential nominees.